Away from the quartet, Scotland also recorded a big victory over the champions of Hong Kong, Fiji, and Wales ended England’s 16-game world series winning streak over them. The USA arrived in Singapore on top of the series standings and Mike Friday’s side maintained their form well in order to create a Cup quarter-final meeting with Argentina. 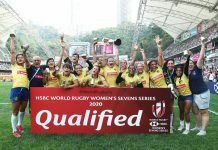 After disappointment in Hong Kong, Australia bounced back in style to create a last-eight contest against England. The Blitzboks will meet Samoa while New Zealand and Fiji will face-off. The matches will commence at 11.30am local time (GMT+8) on Sunday. Gareth Baber’s side have been the top try-scoring team in four of the seven events this series, scoring a competition-high of 184 tries in total. They started their weekend positively by hitting the 50-point mark against Canada. A 19-7 half-time lead turned into a 50-12 result but they lost Jerry Tuwai to injury in the opening moments. The instrumental playmaker was not able to return for the rest of the day’s play. As Scotland weren’t able to back-up their exceptional work against Fiji, falling to Canada, that meant that Fiji’s points difference took a little pressure off going into the final meeting with South Africa. A low-scoring but intense, first half was eclipsed by a fast-paced second. The Blitzboks led 12-7 with two and a half minutes to play before Werner Kok finished the job on the scoreboard. Next, the side stunned in-form France. After two consecutive Cup final appearances, Les Bleus started well with a 26-7 win over Hong Kong and held Australia to 12 points apiece at the interval. But, the second seven minutes belonged to Australia – a quick double via Lachie Miller and Henry Hutchison – gave them the advantage that they required. In contrast, France weren’t wholly accurate in their work. Finally, a seven-try, 47-0 victory over Hong Kong finished Australia’s job in style. After Les Bleus’ dip against Australia and Argentina’s earlier win and loss, the two faced-off against each other for a place in the Cup quarter-finals. German Schulz and Los Pumas Sevens hit first and they dominated the first half. The hold on the game continued after the pause as France became frustrated at finding themselves 19 points down. Although Les Bleus finished with the final say on the scoreboard, errors and penalties were their undoing. The 19-7 result secured Los Pumas Sevens a meeting with world series leaders, USA, in the last eight and pushed France into the Challenge Trophy competition. The final pool clash saw the USA and England duel for the 46th time on the world series. The head-to-heads showed just 12 victories for the USA compared to England’s 30 (three draws), however the USA made this latest match their own. With a minute on the clock, captain Madison Hughes set their tone and they were relentless of their pursuit for victory. A 22-7 cushion was created with three minutes to go and England had to keep their cool because a loss of 26 points or more would have seen them miss out on the Cup quarter-finals. Instead they put in a stellar defensive shift, making over 30 tackles in total, and held the encounter to finish with that scoreline. Elsewhere in the pool, the in-form Samoa had a competitive first half against Los Leones before they put their foot on the accelerator. Melani Matavao’s excellent chip-and-chase try finished the first half and helped to produced their 21-7 cushion. After, the side never looked back to achieve a 40-14 result. Sir Gordon Tietjens’ outfit also proved to be too strong for Japan, 57-7, and that set up an enticing duel for pool supremacy against the All Blacks Sevens.